The problem was that Red Rose "borrowed" the British Brooke Bond series 16 called "Transport Through the Ages" and goofed one of the cards during the transformation to a Red Rose series. With this particular card they changed the painting because they didn't want a British sub but after they replaced it with an American one, they forgot to change the text. They made a lot of changes and made them right. If you would like to read about what else they changed when they "Americanized" the Transport series, click here. So What Is the Issue With Number 47, the Nuclear Sub? Thanks to the keen eye of collector Dave White from the UK, we see that the British series (left above) depicts the British nuclear sub Dreadnought while the Americas version (right above) gets a new image, the American nuclear sub, Nautilus. We can confirm that each is Dreadnought and Nautilus respectively by comparing them to some actual photos of the subs. 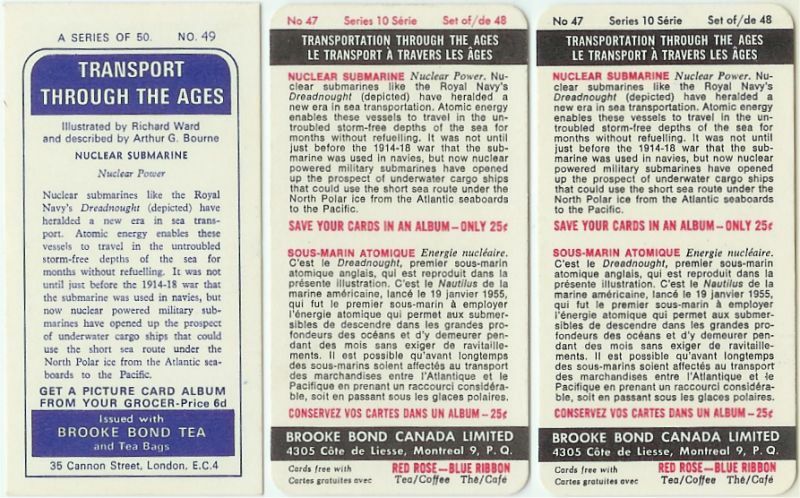 I have reviewed all of the nuclear submarine cards that I own and all are alike regarding text. I have every belief the text is the same across all three variations. Now we are left to wonder, did Red Rose ever figure out that they did it wrong and just never changed the text or have they gone blissfully along, not aware of the goof. The good news is, the Red Rose Nuclear Submarine is an easy error card to collect, they are all errors! Remember, keep your eyes peeled, even on the common cards. You never know what rare find may be lurking around the corner... just waiting for you to discover it. Thanks again to Dave. Keep 'em coming.